Pass the time away visiting this unique barn filled to the brim with all kinds of clocks. Known for his creative wooden carved clocks, Myron Harsch shares his favorite pastime with you, including a collection of his own animated clocks that have been recognized at the International Clock Shows! See “Three Little Pigs” in action, “Duck Hunting”, a clock featuring Abraham Lincoln made of Kansas Cherry wood with the Kansas flag (34 stars), and many more. Be sure to ask him about the clock he made for Boxcar Willy! 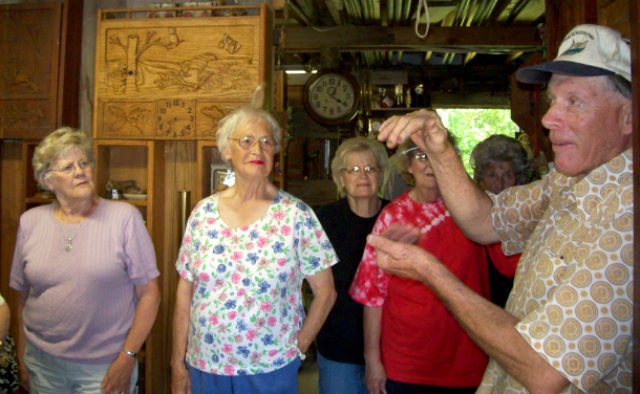 You will walk in puzzled, and walk out with a new appreciation for "barn treasures". Now, just to let you know, Myron doesn't carry a cell phone. You'll have to make an appointment to see him by calling him around 10 p.m. in the evening!